New philanthropy education program helps students make a difference. DiscoverGiving is an opportunity to educate a new generation of philanthropists. TisBest Philanthropy today launches DiscoverGiving, a classroom philanthropy project for grade school students. The DiscoverGiving curriculum enables teachers to engage students in real-life generosity and altruism experiences. 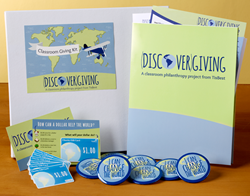 DiscoverGiving comes to classrooms by way of a Classroom Giving Kit, a plug-and-play philanthropy resource available through the TisBest website. Each kit includes lesson plans for grades 3-6, six fun and engaging activities, educational handouts for students and their families, an 18x24” classroom poster, “I Can Change The World” buttons, and a TisBest Charity Gift Card worth $1.00 for each student to donate to the nonprofit charity of their choice. At the start of the DiscoverGiving lesson, teachers introduce students to the concept of philanthropy by asking students to reflect on times they have shared their time, talent or treasure to create positive change. The teacher then helps students make a charitable donation with a TisBest Charity Gift Card. Students each “spend” a $1.00 charity gift card by choosing a charity to support in an area of interest to them, such as protecting the rain forest or endangered species, caring for sick kids, or feeding a hungry family. Through this hands-on giving experience, students learn that they can make a positive difference in the world. Charities supported by student donations receive 100% of the funds from each $1.00 TisBest Charity Gift Card. Following the charity gift card activity, students participate in literacy-focused enrichment activities which encourage students to think beyond their $1.00 charity gift card and identify specific ways they can continue to make a positive difference in the word around them. DiscoverGiving lesson plans are compliant with Common Core Curriculum State Standards, allowing teachers to include DiscoverGiving in their regular lesson schedule. At the end of the lesson, each DiscoverGiving student receives a button with the message, ‘I can change the world’. DiscoverGiving Classroom Giving Kits cost $62 plus $1.00 per student (for example, the total cost for a classroom of 30 students would be $92.00). Shipping is free, and the entire purchase is tax-deductible. Anyone can order a DiscoverGiving Classroom Giving Kit through the TisBest website. TisBest provides information for teachers, families and sponsors–anyone who provides a Classroom Giving Kit to a classroom– on their website. To learn more about DiscoverGiving, visit http://www.TisBest.org/DiscoverGiving. Click here to watch the video introduction to DiscoverGiving. TisBest Philanthropy is a 501(c)(3) nonprofit organization dedicated to fostering the growth of non-material gift-giving. TisBest created charity gift cards in 2007. Charity gift cards work like conventional gift cards, but with one important exception: the recipient of a charity gift card "spends" it by choosing a charity to receive the funds. With a TisBest Charity Gift Card, you make the donation and your recipient decides how to spend the donation, choosing from TisBest's 300+ charity partners. Learn more at http://www.tisbest.org.